After demythologising the IPO’s myth-making, let us now turn to some other copyright memes currently doing the Internet rounds. 1. ‘Photographers must register their work straight away.’ WRONG. No legal orphan works exploitation scheme or ECL can be launched until the Regulations enabled by the Enterprise and Regulatory Reform Act have come into force, and that is unlikely to be before October 2013. After that, some form of registration will be necessary in practice if you are to guarantee that your work cannot be declared orphan. The PLUS Registry is a very good place to start and we urge all photographers interested in protecting their property to sign up, get a PLUS ID, and embed it in the metadata of all their photographs. 2. ‘Orphan works’ are free to use right now.’ WRONG. There are no legal orphan works exploitation schemes in the UK and there will not be until the ERR Act Regulations come into force, and even then ‘orphan works’ will not be free to use. Their exploitation will be licensed on completion of a verified ‘diligent search’ and after payment of a fee to the licensing authority. Orphan works will not be ‘free’. 3. ‘It is misleading to claim that the ERR Act would permit digital images to be used without permission and compensation for the rights holder, and it is surprising that the claim has gained such currency.’ WRONG. Let’s assume the ‘orphan work’ in question is yours. If it is exploited as an orphan work, and therefore without your knowledge, permission, and payment to you (because you could not be found and contacted by the work’s intending exploiter), or your work is exploited under ECL (without your knowledge, permission, and payment to you because you are not a member of the ECL licensing body and have not opted out of its scheme), it is absolutely true to claim that the ERR Act would permit digital images to be used without permission and compensation to you, the rights holder. If it did not, it would not permit the licensing of orphan works, or ECL, both of which are intended and designed to legalise the exploitation of works without their owners' knowledge, permission, and payment to them. 4. ‘Copyright is a balance between rights owners and users, and its purpose is to benefit the consumer by ensuring that works are created.’ WRONG. The purpose of UK copyright law is to grant authors of artistic works an automatic, exclusive property right (with attached moral and human rights) of limited duration, with certain limitations and exceptions. 2 Rights subsisting in copyright works. • (1) The owner of the copyright in a work of any description has the exclusive right to do the acts specified in Chapter II as the acts restricted by the copyright in a work of that description. 5. ‘Copyright infringement, other than in certain limited circumstances, isn’t a criminal offence. It’s what, in law, is described as a “tort” – a civil wrong.’ WRONG. This is a common, oft-repeated mistake. Copyright infringement is a criminal offence in most cases. It is both criminal and civil. The relevant offence is S107 (2A) of the Copyright, Designs and Patents Act 1988 which makes it a criminal offence to breach copyright by communicating work to the public, either if you're a business, or if you're a private individual (in the latter case only if it materially prejudices the interests of the owner). It applies where they have reason to believe that they are infringing copyright - which will be in almost all cases since copyright is automatic, unless they have good reason to believe that copyright may have expired (70 years from death of author) or been expressly waived. In essence copyright infringement, at least where the image is published, e.g. on the web, is a criminal offence. This criminal offence is commonly referred to as 'copyright theft'. 6. ‘What benefit does the owner of an orphan work actually get from their copyright? They can’t earn any money from it, as nobody can find them to pay them.' WRONG. Again, let’s assume the ‘orphan work’ is yours. Your work might already be exploited elsewhere, by other users, or in other media, and therefore not be an orphan in those contexts. A classic example is that of authors self-publishing eBooks. There is no guarantee that a 'diligent search' will reveal this: remember, intending exploiters must carry out a ‘diligent’ search, not an exhaustive search, and the academic sector wants ‘diligent’ in practice to mean ‘not very diligent at all, and only for some samples from an entire collection’. Many so-called 'orphan works lists' contain considerable numbers of false entries, including the HathiTrust and ReLIRE lists. It may not be your intention to enter them into the market in the first place, and indeed your wish that your works NOT be commercially exploited. As far as you’re concerned, ‘benefit’ can take many forms other than the proceeds of commercial exploitation, and indeed such exploitation can and does reduce the value of those other benefits to you. Exploitation as an orphan work is likely significantly to reduce the residual value in your work, should you then choose to exploit it commercially yourself. If licence fees payable to you as a revenant rights owner (that is, you discover your works being licensed as orphans and reclaim them) or penalties for false exploitation as orphan works are no higher than remedies currently available for copyright infringement, then the orphan works scheme will be of no benefit to you, only to rights users. 7. ‘Intellectual property isn’t real property - it’s just a philosophical construct.’ WRONG. All rights, including physical property rights and human rights, are philosophical constructs. IP as a property right is part of the US Constitution. All modern law, legislation and policy is based on the idea that it acts for society’s greater good. Of course, there is dispute between different schools of philosophy and different cultures as to exactly what ‘society’s greater good’ means. Citizens must be able to express their own opinions. According to the European Court of Justice a copyright work is ‘the author’s own intellectual creation reflecting his personality.’ It is an expression of its creator’s opinions and represents its creator, which is why EU and UK copyright law includes these inalienable moral rights. Modern western democracies are based on the principles of individual responsibility, universal literacy, and universal suffrage. In an age of widespread participation in the democratic process via written and visual communication the moral rights to be identified as the author of your work; to object to derogatory treatment of your work; and to object to false attribution of your work; are fundamental. They guarantee that your ‘free speech’ is authentically yours and ‘reflects your personality’. It remains scandalous that you must proactively assert your moral rights, and that some authors lack the right to do so. Orphan works schemes and ECL allow copyright works to be exploited without their authors’ and owners’ knowledge, permission, and payment to them. Such schemes appear to be incompatible with both the spirit and the letter of Articles 27 and 12 of the Universal Declaration of Human Rights. 9. ‘Copyright law must keep up with technological progress.’ WRONG. Copyright is the philosophical principle of your ownership of and control over your expressions of your ideas and opinions. It is a combined property, moral and human right which is quite deliberately agnostic towards technology. There are similar examples of rights being independent of technology in other legal areas. For example, throughout most of history, most cultures have adhered to the philosophical principle that ordinary citizens must not kill each other, despite technological progress and the increased efficiency of lethal weapons. The USA is full of privately held guns but murder remains a capital offence. Another example: it is quite possible that within a few years advances in scanning technology and 3D printing will make it quick and easy for criminals to create functional keys for all but the most expensive and sophisticated locks. What then? Declare private property null and void because ordinary citizens can no longer afford to keep their doors locked? De-criminalise burglary? Of course not; such ideas are absurd. So it is with copyright and technology. The old 20th century copyright law just doesn’t work; things cannot remain unchanged.’ RIGHT. Stop43 put a lot of time and effort into our submission to the Hargreaves Review describing how it doesn’t work, and suggesting ways to correct it. ‘Some kind of solution for orphan works is needed and will appear.’ RIGHT. There are already orphan works schemes in operation in Canada, Japan, Hungary and some other countries. All are little-used, and according to analysis carried out by BSAC (Annexe C) conflict with international law and/or if implemented here would contradict EU law. Stop43 proposed and published our own orphan works ‘solution’ three years ago and included it in our Hargreaves submission. ‘Some kind of ECL will appear.’ RIGHT. It already has in the Nordic countries, but according to BSAC (Annexe D) it is very different in character to that proposed by the IPO. In practice many collective licences granted by UK collecting societies are de facto ECLs because inevitably they encompass works belonging to non-members. DACS’ Payback scheme is one such, and DACS has admitted it. ‘The only constructive thing is to try and shape what’s coming. We can’t Canute our way back to 1990 or be left behind with neither input nor credibility.’ RIGHT. And this is why over the last three years Stop43 has written more than 150,000 words of submissions; given oral evidence to the BIS Select Committee; attended all but two of 2011’s Copyright Consultation London events; initiated, participated in or supported the high level briefing paper, the threatened Judicial Review, and the US photographic representative organisations’ letter to BIS MInister Vince Cable; attended meetings by invitation with Lords, MPs and Ministers including a forthcoming meeting with IP Minister Viscount Younger; and is a member (again by invitation) of the IPO’s Orphan Works and ECL Consultation Working Group and the Copyright Hub Images and Metadata workstream. 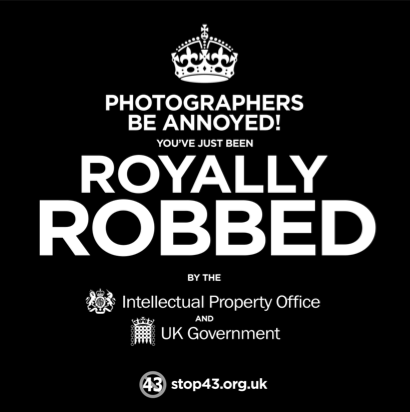 The Association of Photographers regards Stop43 as an ally; the Chair of the British Photographic Council has said: “most BPC members support Stop43”. Input and credibility are vital. Following on from IP Minister Lord Younger’s surprisingly candid admissions to the DCMS Committee that he is “very aware of [Google's] power”, that “[Google has] access, for whatever reason, at higher levels than me at No. 10” (at 11:15), and the somewhat unedifying sight (at 10:43) of IPO copyfighting mandarin Ed Quilty handing the Minister his lines, it is useful to look at the attitudes behind those lines. Recently the IPO published a ‘myth and fact information document’ designed to dispel copyright ‘myths’ that have propagated on the Internet since the passing of the Enterprise and Regulatory Reform Act. Sadly, this document is itself so distorted by misrepresentations, evasions, half-truths, irrelevancies and omissions that it might be said that the IPO is acting with impropriety - as a government institution the IPO ought to be presenting the facts impartially and in a balanced manner, but their presentation unfortunately amounts to a twisting of the facts. All copyright works including so-called ‘orphan works’ have a creator and owner, and our remarks assume you are the creator and owner of the ‘orphan work’ in question. So let’s dispel some myths. IPO ‘Fact’ – The powers do not remove copyright for photographs or any other works subject to copyright. THE TRUTH: no one we know of has said that the provisions remove the automatic right to copyright. Rather, in undermining copyright as it is guaranteed by international law - your ‘exclusive right of authorizing the reproduction of [your] works, in any manner or form,’ and also undermining the fundamental principle in international law that 'the enjoyment and the exercise of these rights shall not be subject to any formality', the provisions attack the core value and meaning of your copyright. Copyright is your right to prevent your work being used without your permission. Now people will be able to use your work without your permission. Yes, your automatic right to copyright is still there – but it will no longer be copyright as we know it, as it is supposed to be guaranteed by international law, for you as an individual rights owner lacking the corporate resources to ensure that your works do not become orphaned. IPO ‘Fact’ – A licence must be obtained to use a work as an “orphan”. This will require the applicant to undertake a diligent search, which will then need to be verified by the independent authorising body which the Government will appoint before a work can be used. THE TRUTH: The IPO agrees with its so-called ‘myth’: anyone can use your photo they have found on the internet as an ‘orphan’ if they cannot find you after a search, and after being granted a licence by the government. IPO’s ‘Fact’ – the Orphan Works scheme and Extended Collective Licensing (ECL) are separate and the orphan works scheme is about licensing of individual works.The Government will have no power to impose ECL on a sector, and the safeguards included in the scheme mean that ECL is only likely to be an option where there is strong existing support for collective licensing. Any rights holder who is worried about how their work could be used under an ECL scheme will always retain the ability to opt out. THE TRUTH: Metadata stripping is irrelevant in this context. Such stripping is not necessary for licensing en masse under ECL, because the IPO’s ECL is intended eventually to allow any kind of work to be licensed en masse without your knowledge, permission, and payment to you, orphan or not, with or without metadata, unless you have opted it out of ECL or you are a member of the ECL licensing body, in which case for you the ECL becomes an ordinary collective licence. IPO’s ‘Myth’ – anyone will be able to use my photos for free if they cannot find who owns them? IPO’s ‘Fact’ – If a work is licensed following the verification of the diligent search, there will be a licence fee payable up-front for its use. The fee will be set at the going rate. IPO’s ‘Fact’ – Anyone wishing to use a work as an orphan must first undertake a diligent search for the rights-holder which is then verified with permission to use the work granted by the Government appointed independent authorising body. If the work is not genuinely orphan then the rights-holder should be found, if the search is not properly diligent, no licence will be issued. THE TRUTH: so that means that after going through the motions, ‘anyone can use my photos without my permission’. IPO’s ‘Fact’ – Given the steps that must be taken before an orphan work can be copied, such as the diligent search, verification of the search and payment of a going rate fee, it is unlikely that the scheme will be attractive in circumstances where a substitute photograph is available. The rate payable for an orphan work will not undercut non-orphans. THE TRUTH: the IPO appears not to have heard of the laws of supply and demand. How on earth will the government-regulated body know what you might have charged for a particular image? How can they assess its scarcity, its exclusivity value, or whether it should have been sold at all? They can’t. As it stands, the IPO intends ECL schemes to licence both orphan and non-orphan works. So, the statement ‘the rate payable for an orphan work will not undercut non-orphan works’ is irrelevant because the real market damage will be caused not by orphan works exploitation schemes but by ECL, which does not require a costly and time-consuming prior diligent search and subsequent verification, and is specifically intended to facilitate the exploitation of works en masse at minimal cost to the exploiter. A new, large, low-cost supply of images will inevitably reduce overall market prices, and with it income for rights owners. Why should an exploiter negotiate a primary licence with you if they can exploit your work very cheaply under a bulk ECL licence? A further point: without a prior search of some kind, how will ECL exploiters identify opted-out works? The IPO has told us that ECL of opted out works will be copyright infringement. IPO’s ‘Fact’ – The licences to use an orphan work will not allow sub-licensing. THE TRUTH: There is nothing in the Act that prevents the regulations from allowing sub-licensing. Regulations in Statutory Instruments are easily changed. The first set of regulations may not allow it (we don’t actually know yet because draft regulations have not been published), but at some point, in a year or two or three or four, someone is likely to see this as a great commercial opportunity and have it introduced into the next set of regulations, or the one after that. All of the Nordic ECL legislation has rights owners’ safeguards such as this explicitly in the enabling Act, where they are visible to all and cannot be changed except by another Act of Parliament. The UK doesn’t. There is a reason for this, and that reason is almost certainly so that the safeguards can slowly be removed in subsequent revisions to the regulations. THE TRUTH: the stripping of metadata is one of the key steps to disassociating a work from its owner. Unless there is another way of tracing you it creates a work that can then be declared an orphan work should someone want to use it without contacting you. Stripping of metadata has been carried on an industrial scale by the likes of the BBC. The IPO has on a number of occasions declared its mistaken belief that stripping of metadata is a criminal offence. It isn’t, which is why bodies such as the BBC have been able to get away with it. If the IPO can’t even get basic facts like this right, how can we trust them on understanding the more complex parts? IPO’s ‘Fact’ – Copyright will continue to be automatic and there is no need to register a work in order for it to enjoy copyright protection. THE TRUTH: yes, and copyright – your right to stop people copying your work without your permission – will no longer exist as such from the individual author’s perspective. It will remain as the ghost of the right to say no only if whoever wants to use your work happens to be able to find you, and even then only if you have opted out of ECL. Will it be necessary to register your photos to claim copyright? Yes, if you want copyright in the old sense – you’re going to have to make your pictures readily searchable. There is an industry-led effort to create what will in effect act as a super-register called the Copyright Hub. If you want to have copyright in the old sense – the sense that we understand it, not the corpse, then you will have to register your images one way or another. The details have not yet been finalised. IPO’s ‘Fact’ - Other jurisdictions already allow the use of orphan works. The UK powers are largely based on what happens in Canada – which has been licensing orphan works since 1990. THE TRUTH: If the UK’s orphan works exploitation schemes are largely based on Canada’s they will most likely be little used, as are Canada’s, and therefore be of relatively little practical threat to most rights owners. In contrast, the UK is doing something radical and unprecedented with the ECL powers. How curious that the IPO chooses not to mention this. At present no photographers' collecting society currently exists (for primary licensing - the DACS Payback scheme licenses only those secondary rights that photographers find it impractical to licence directly) and therefore ECL will not apply to photographs - for now. Stop43’s view is that photographs are so central to ECL plans and the desires of ECL’s intended users that one way or another this hurdle will in the fullness of time be overcome. If you want to understand what orphan works and ECL are really all about, watch the excellent documentary Google and the World Brain. It explains beautifully what the copyright killers are trying to achieve. Once upon a time we had the distinct and separate concepts of copyright and patent. In international, EU and UK law copyright defines artistic works as property and is a combined property, moral and human right of limited duration (usually 70 years after the author’s death) granted automatically, without formality and free of charge to creators of artistic works. In contrast, a patent is a monopoly exploitation right of short duration (usually 20 years after the issue of the patent) granted to the inventor of a new technological process or product after formal application to government, payment of a fee, and verification that the invention is indeed novel and not obvious. Both are property rights, but apart from that they could hardly be more different. DCMS was responsible for copyright; the Patents Office handled patents. A while back it became trendy to lump both of these, plus design rights, trade marks, etc. under the umbrella of intellectual property, and the old Patents Office, full of experts on patents but knowing little of copyright, rebranded itself as the ‘Intellectual Property Office’. Creators, inventors and users of IP all complained of problems with the Copyright, Designs and Patents Act 1988, the UK’s copyright and patent law, and following the Digital Economy Bill Clause 43 debacle under the last Labour government the then Tory opposition said they would introduce a proper Intellectual Property Bill. In late 2010 the coalition government announced the ‘Hargreaves Review’ into Intellectual Property and Growth, which recommended very significant changes to copyright, and a bit of tweaking to the patents system. Not a peep about copyright. What happened to it in the interim? In comparison, the relatively minor changes Hargreaves recommended for other forms of IP are to have an entire Bill to themselves. The IPO failed in their ERR Act attempt to grab powers for themselves to make copyright exceptions. What do we think the chances are of a similar power grab returning in the IP Bill? Hargreaves, the British Library and the academic sector want contract law not to be able to override copyright exceptions. A clause to this effect is sure to be in the IP Bill. Clauses to introduce copyright exceptions which cannot be brought in under the European Communities Act 1972 2(2) are sure to be in the IP Bill. After the last three years of the copyright wars and the way things have ended up, smirkingly to introduce an Intellectual Property Bill adds insult to injury to anyone who ever makes an artistic work. It stinks. Read his full letter here, and then Tweet it to MPs.